Sophomore guard Terry Nolan Jr. looks to make a pass during Saturday night's game against Valparaiso. The Colonials lost to the Crusaders 82–79. Three-point shooting was the name of the game in men’s basketball’s three-point loss to Valparaiso Saturday night. The Colonials (2-8) got off to a strong start in the first half, leading the Crusaders (6-4) by 10 points in the starting frame, but the Colonials started losing steam heading into the locker room and a slow start out of the gate in the second half let Valparaiso take the game 82–79. The Crusaders finished the night shooting 15-for-27 from the three-point line, good for 55.6 percent and the second time this season GW has allowed an opponent to finish the night going more than 50.0 percent from three. Heading into the night, the Crusaders averaged less than seven made threes per game. Head coach Maurice Joseph said the game plan was to double team Valparaiso’s 7-foot-1-inch redshirt junior center Derrik Smits – who averages 14.5 points per game – and force him to make turnovers to combat the team lacking one of their top rostered players junior forward Arnaldo Toro. “You try to play the numbers a little bit, especially with us short handed right now, you try to play the numbers a little bit right now, and it didn’t work out in our favor,” Joseph said. 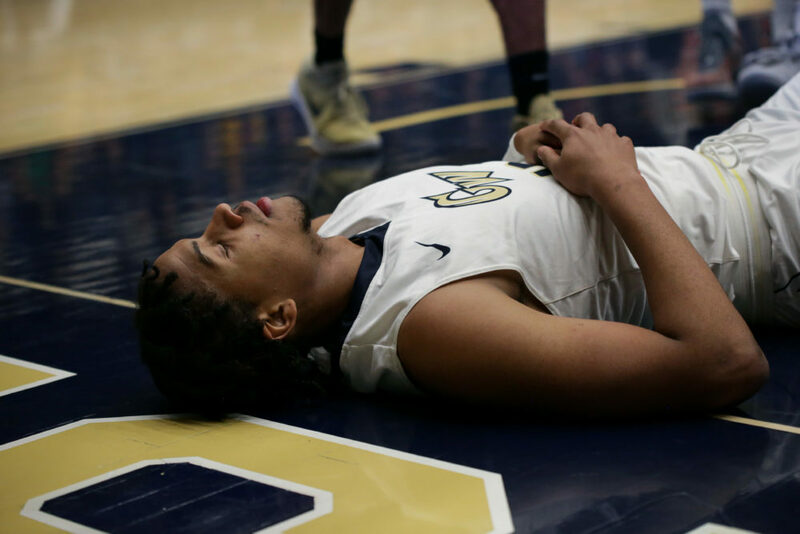 Redshirt junior guard DJ Williams lies on the court and takes a breath after being knocked to the floor by Valparaiso. The Colonials’ hot first half came at the hands of sophomore guard Maceo Jack, who dropped 18 points in the opening 20 minutes. GW finished the first half shooting 18-for-27 from the field, good for 66.7 percent. GW’s above-average shooting performance was a result of team selflessness, Jack said, who ended the night with a career-high 23 points. 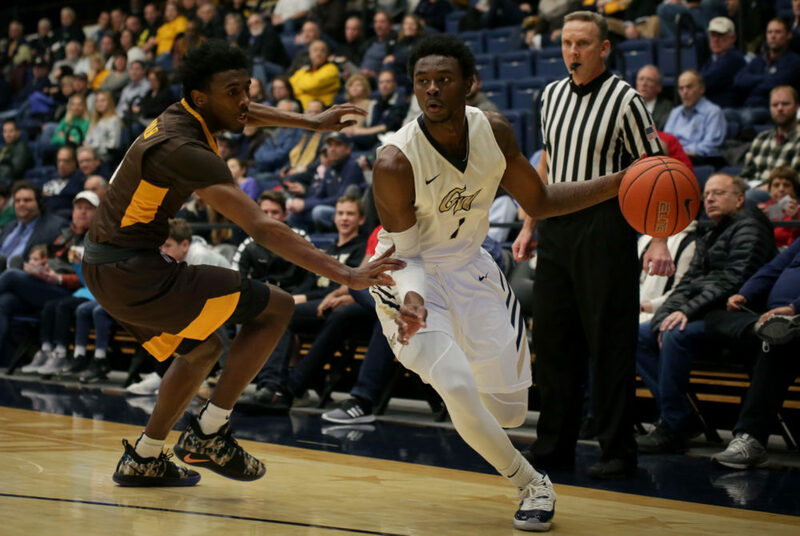 GW’s leading scorer redshirt junior guard DJ Williams was held scoreless until the 14th minute of the half, when he hit a jumper to put the Colonials ahead 32–23. The Colonials broke the 40-point mark in the first half for the first time this season against the Crusaders. The team has not scored more than 40 points in any half since they faced off against Virginia Nov. 11 and dropped 40 points on the Cavaliers in the second half. Despite leading by double digits at one point in the half, the Colonials let the Crusaders sink five three-point shots in the final six minutes of the frame to head into the locker room holding a 42–40 lead. The Colonials opened play in the second half looking sluggish. Valparaiso redshirt sophomore guard Bakari Evelyn – who scored 27 points on the night – dropped two straight three pointers to open play. At one point, Valparaiso led by 13 points, but GW’s sense of urgency returned with less than nine minutes to play, when sophomore guard Terry Nolan Jr. fed junior guard Justin Williams a pass which Williams dunked to bring the score to 69–61. The Colonials went on a 13-5 run, capped by a three pointer from Nolan, that brought the game to a 74–74 tie with less than four minutes to play. From there, GW’s defense let up two more three pointers that allowed the Crusaders to pull away a final time. Mazzulla said the team’s inability to finish out the run was a result of being “complacent,” something the team needs to continue to work toward overcoming in practice. The Colonials will return to action Friday, when they will take on Howard at the Smith Center. Tipoff is scheduled for 7 p.m.